This is one of those books that I could only read a chapter, sometimes two, at a time. It was really interesting, with lots of GORGEOUS pictures of libraries, but it’s still a history and sometimes boring. It was very in-depth, though, starting with “The Ancient Libraries” and moving through the middle ages, to the Renaissance, to the early modern period, to the 21st century. Murray talked about all the books lost to religions, primarily Christianity, suppressing other religions’ ideas and burning their books and records, and also mentioned in many places the casualties of war – bombed, burned-out libraries, priceless ancient books being lost to fire and looters. The latter was preferable, as that usually meant the book would resurface somewhere! I was a little disappointed that he didn’t talk more about the development of cataloguing systems, and barely mentioned the Dewey Decimal System at all. I thought that was really odd, considering it’s the most-used cataloguing system today! He talked about the difficulty of maintaining a catalogue, but didn’t discuss a lot about how that changed in the modern age. 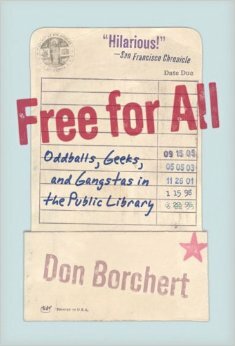 If you’re interested in libraries, I would definitely recommend this book. As histories go, it wasn’t nearly as dry as some I’ve read, and the pictures were fabulous. I’d definitely like to own this book someday, but for now it will have to go back to the library. 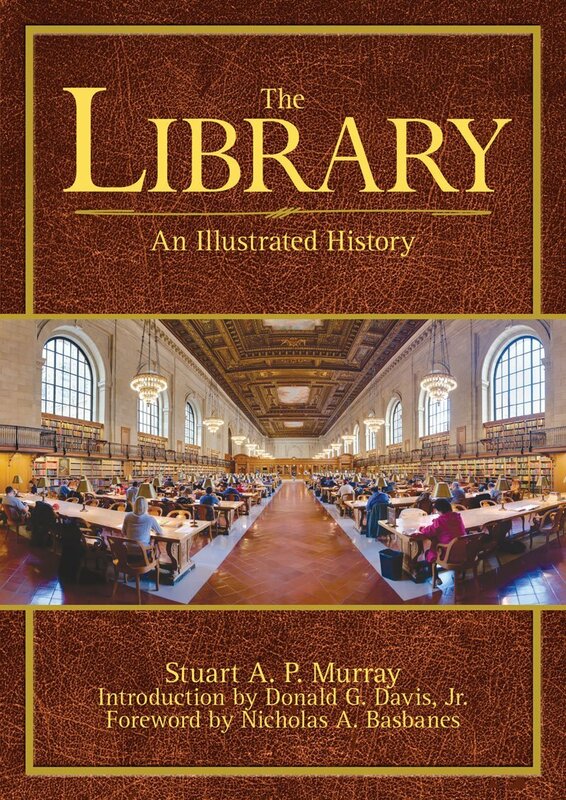 “The first libraries appeared five thousand years ago in Southwest Asia’s ‘Fertile Crescent’…the birthplace of writing, some time before 3000 BCE,” writes Stuart A. P. Murray, introducing his fascinating exploration into the history of the library. With the dawning of advanced civilization, the written word flourished and the need for libraries became paramount in many societies. Throughout the history of the world, libraries have been constructed, burned, discovered, raided, and cherished – while the treasures they housed evolved from early stone tablets, to beautifully illumined vellum, and to the mass-produced, bound paper books and the digital formats of our present day. The Library opens doors to the libraries of ancient Greece, early China, Renaissance England, and modern-day America. This volume speaks to the book lover in all of us while offering a panoramic view of the history of libraries across the centuries. The ALA Young Media Award Winners! Update: The sequel, The Iron Season, is due out sometime in 2018! Yet another fantastic debut novel! My husband picked this up at the library; the dark blue edging on the pages had caught his attention, as well as the gorgeous blue and gold cover with its enigmatic title. I am very glad he brought it to my attention, as it was a beautiful, touching read. 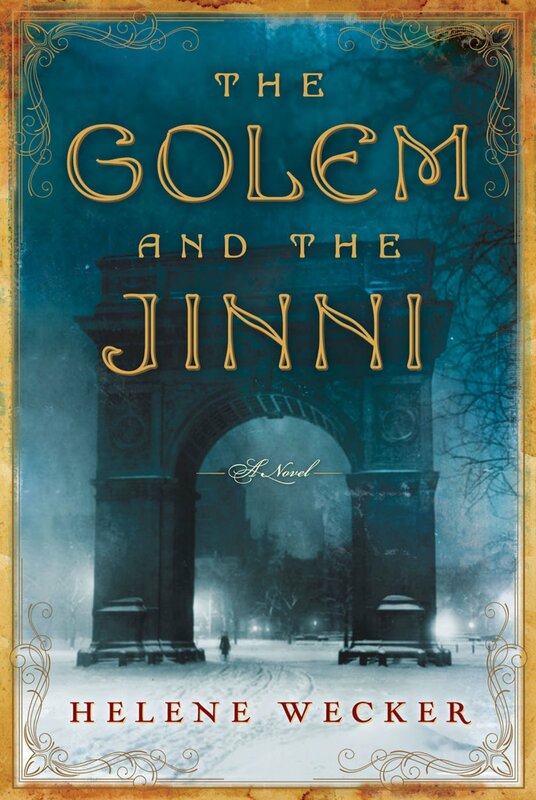 The Golem and the Jinni is the tale of two immigrants in early 19th century New York. These aren’t your typical immigrants, however. The Golem, created by a mystic in Poland, was made-to-order by a man wanting a wife. He died on the voyage over, hours after awakening her. With her original master-bond broken, the Golem is learning her way around New York and human society, with the help of an old Jewish rabbi who recognized her for what she is. The Jinni, on the other hand, has been bound in a bottle for close to a thousand years, and is released accidentally by an Arab tinsmith. He is also learning about New York and human society, but where the Golem is coming at it from a place of innocence, he is jaded and old. The two eventually meet, recognizing each other for non-human, and begin a wary friendship built on their mutual lack of needing to sleep and hatred of boredom. As the novel progresses, their lives begin to intertwine in unexpected ways, and we learn more about their histories from flashbacks; in the Golem’s case, the flashbacks are of her creator’s life, since we see the beginning of her own at the start of the novel. As the novel progresses, it builds up momentum until it seems an unstoppable force heading to its surprising conclusion. I thoroughly enjoyed this novel, and find myself surprised it was the author’s first. It brushed on philosophical questions, moral questions, societal norms – and all of it so naturally. The book delved into human nature and the nature of free will, with both main characters unsure of their own capability for free will for different reasons, and fighting those very limitations on their individuality. I discovered in a Q&A on Wecker’s website that she is Jewish and her husband is Arab-American, which explains partly why she was able to blend the two cultures’ mythologies so easily (and to wonderful effect!) in this book. I’ve been having wonderful luck with debut novels lately, I wonder how long that can hold out? “Helene Wecker’s dazzling debut novel tells the story of two supernatural creatures who appear mysteriously in 1899 New York. Chava is a golem, a creature made of clay, brought to life by a strange man who dabbles in dark Kabbalistic magic. When her master dies at sea on the voyage from Poland, she is unmoored and adrift as the ship arrives in New York Harbor. Ahmad is a jinni, a being of fire, born in the ancient Syrian Desert. Trapped in an old copper flask by a Bedouin wizard centuries ago, he is released accidentally by a tinsmith in a Lower Manhattan shop. Struggling to make their way in this strange new place, the Golem and the Jinni try to fit in with their neighbors while masking their true names. Surrounding them is a community of immigrants: the coffeehouse owner Maryam Faddoul, a pillar of wisdom and support for her Syrian neighbors; the solitary ice cream maker Saleh, a damaged man cursed by tragedy; the kind and caring Rabbi Meyer and his beleaguered nephew, Michael, whose Sheltering House receives newly arrived Jewish men; the adventurous young socialite Sophia Winston; and the enigmatic Joseph Schall, a dangerous man driven by ferocious ambition and esoteric wisdom. I’m honestly not sure what I just read. I’m used to fiction plots having twists, or making you wonder what’s going to happen, or having a moral lesson. This – didn’t really do any of those things. You’re told what’s going to happen in the first sentence of this novella. There’s only one question, and it’s never answered. I’m not really sure what the lesson is, if there is one. I’m just baffled at the entire thing. 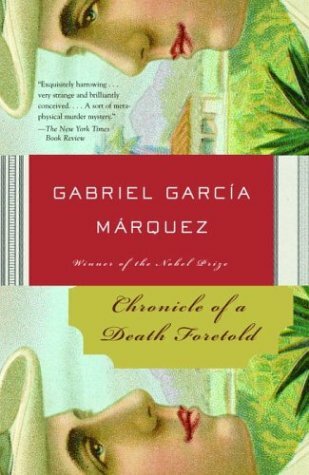 Chronicle of a Death Foretold, by Nobel prize winner Gabriel Garcia Marquez, is a novella about a man’s death. A woman gets married, her bridegroom discovers she’s not a virgin, returns her to her family, and her brothers kill the man who stole her virginity. That’s really all there is to the story. The brothers are completely open about what they plan to do – the narrator thinks they didn’t really want to carry out the murder and were hoping the townspeople would prevent them from doing so. The narrator is one of the townspeople, a friend of the victim, who is investigating the entire incident some twenty years later, trying to figure out why it happened and why exactly no one was able to prevent it. I’ll be reading another Garcia Marquez book soon – Love in the Time of Cholera – and plan to watch the movie, too, before I review it here. So I’ll give him another shot. But Chronicle of a Death Foretold just…confuses me. A man returns to the town where a baffling murder took place 27 years earlier, determined to get to the bottom of the story. Just hours after marrying the beautiful Angela Vicario, everyone agrees, Bayardo San Román returned his bride in disgrace to her parents. Her distraught family forced her to name her first lover; and her twin brothers announced their intention to murder Santiago Nasar for dishonoring their sister. Yet if everyone knew the murder was going to happen, why did no one intervene to stop it? The more that is learned, the less is understood, and as the story races to its inexplicable conclusion, an entire society – not just a pair of murderers – is put on trial. My last post was about the book, My Ideal Bookshelf. 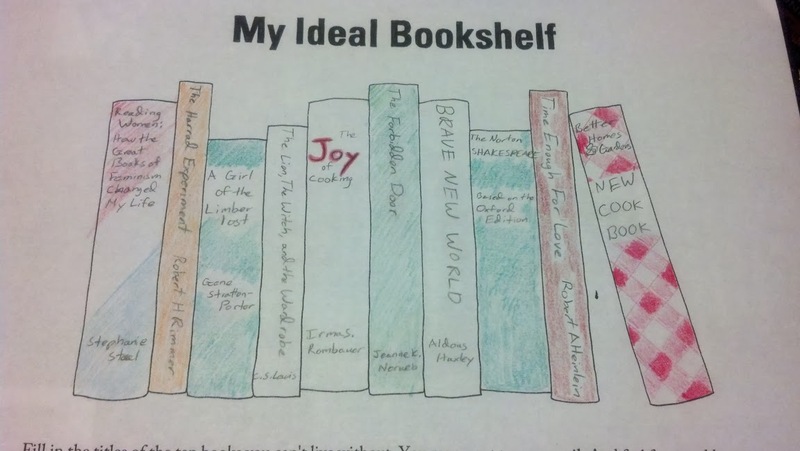 This post is actually my person ideal bookshelf. Let me start by saying my ideal bookshelf is about five shelves high and stuffed with books, but when forced to condense it down to about ten books, this is what I’m left with. I’m not sure all of the titles can be read in the picture, so I’ll talk about each one. First, that red gingham cookbook. The Better Homes & Gardens Cookbook was ubiquitous in my mother’s kitchen – it was stained with canola oil, the pages were gritty with flour, and it had been well-loved for years. When I moved out, my mother bought me my own copy. It is my go-to for basic home cooking. (The Supreme Biscuits in there – I will never look at any other biscuits. Ever.) The other cookbook there is The Joy of Cooking. Even though I don’t use it much, the pure encyclopedic knowledge it holds earns it a place on my shelf. A Girl of the Limberlost has achieved almost fabled status in my memory – I think it was the first really big book I tackled on my own, sometime back in elementary or middle school. It was this large, ancient-looking dark green book with gold lettering on my grandmother’s shelves. I opened it and sat in one of her uncomfortable chairs for hours, lost in a swamp with a girl hunting for butterflies. I’d like to find it again and re-read it, but at the same time I don’t want to spoil the sense of wonder I associate with it. Shakespeare I was introduced to in middle school and fell in love with instantly. I have a giant Oxford collection of all of his plays and sonnets – the pages are paper thin, like a Bible, but filled with Shakespeare. It was the very first book I thought of when putting together this shelf. The Harrad Experiment and Time Enough For Love both deal with issues of love and relationships – what in the 70s they called “free love” and what they now call “polyamory.” They’ve helped me to understand and overcome jealousy and my insecurity – they both stress loving a person for who they are, not what they can do for you. Reading Women: How the Great Books of Feminism Changed My Life is an excellent primer on feminist lit. This book added several books to my to-read list and brought the great feminist authors within my reach. All of these books have impacted my life in some significant way; some continue to affect my life every day. It was an interesting exercise, to sit down and figure out exactly which books I felt deserved to be highlighted. It was hard, too! I own so many books – and have read so many others – that picking so few was really tough, but I’m glad I did. What’s on your Ideal Bookshelf?